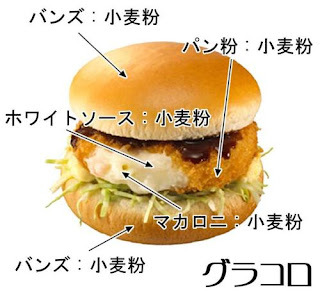 McDonald's Japan launched Gurakoro and Demi Cheese Gurakoro on November 14, 2012 and it's 20th anniversary of this menu. Gurakoro is an abbreviation of Guratan Korokke (Gratin Croquette). Instead of meat patty, they put gratin croquette with shredded cabbage between steamed soft bums. This is the official image of Gurakoro. The first Guratan Korokke was produced back in 1993, and it's been a winter limited menu except 2010 when they had "Big America" campaign. Around 2007, the commonly called name "Gurakoro" became an official name for this. Last year, 2011, they had Tomato Cream Gurakoro, which some of my friends liked and other didn't, but I didn't get a chance to try it so I can't tell. The croquette is white sauce based cream with shrimp and macaroni and really creamy. 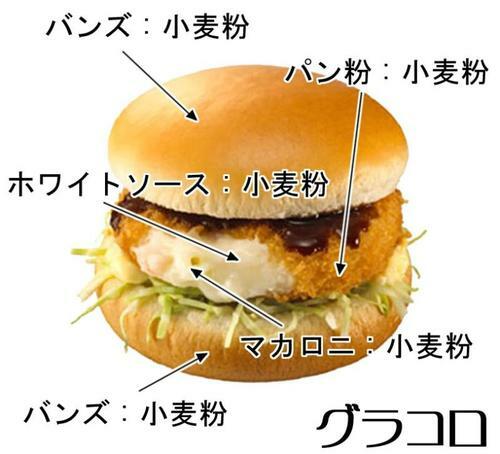 Underneath the croquette, there're shredded cabbage and egg/mayonnaise sauce. Sweet and salty sauce is over the croquette. Demi Cheese Gurakoro has same gratin croquette but it has an additional toppings; demiglace sauce and cheese. I decided to have the regular Gurakoro for my today's late lunch close to 4PM and ran to McD. near my office ordered the regular one to go. I hate mayo, so I asked them not to put the mayo. On a paper wrapping with "Made for You" sticker as I asked no mayo. As it's wrapped in paper for 3 minutes or so, the bum shrunk a little bit. You can tell it's the steamed bum, not the regular one for other burgers. And I was wondering if they had taken the sauce away, too. Here it is, but I call it lazy sauce. I'll ask them next time to put more sauce to make it look like exactly the image. I hadn't had this for a while and realized I had missed Gurakoro. Started thinking when was the last time I had this. It was at least 5 years ago and I remembered mine came with the egg mayo sauce though I asked them not to. This is the reason I kid of stopped eating Gurakoro. Outside of the croquette was really crispy (as it's freshly fried) and inside was really creamy. I could taste shrimp in the sauce, too. You can see macaroni on the right side and right next to it, there's a piece of little shrimp. The finely chopped cabbage added crunchiness to the soft creamy sauce and also to the steamed soft bum. Even though this is one of my favorite menu, I don't want it all year around. Gratin croquette is something I want for cold season and not adequate for humid summer. 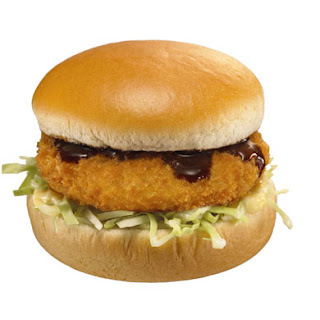 This year, they'll have Gurakoro till middle of December but as it's limited, not sure if all the McD. has stocks till then. I might give it a try for Demi Cheese Gurakoro sometime soon while supply lasts. By the way, a picture of Gurakoro has been retweeted a lot with the fact of Gurakoro. As you can easily picture that Gurakoro consists of tons of flour. This is the famous image and all the parts pointed by arrows are made with flour. But I love carbs, so I don't really care.